Woodhoopoes require sufficient tree holes to roost and nest, and adequate areas of bark and twig foraging surfaces to conceal their invertebrate food. Suitable habitat ranges from scattered trees within arid steppes, to the rainforest canopy. Two species, the forest woodhoopoe (P. castaneiceps) and the white-headed hoopoe (P. bollei), are confined to forest. 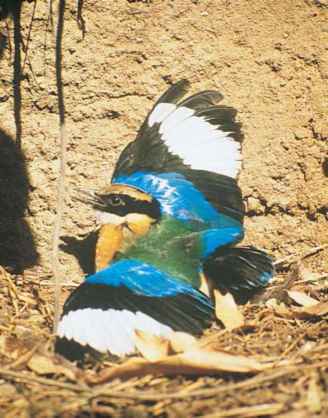 The widespread green woodhoopoe, black woodhoopoe, and the common scimitarbill occupy a range of woodland and savanna types, while the Abyssinian scimitarbill (R. minor) is confined to more arid savanna.